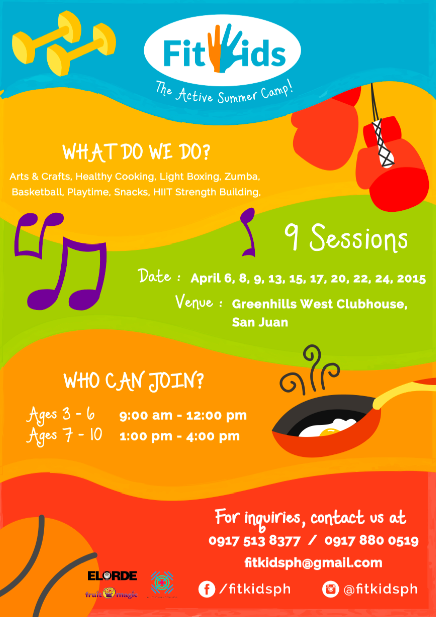 FitKids Summer Camp 2015 Thinking of enrolling your kids to a summer program? Consider enrolling them to #FitKids Summer Camp! I haven’t really thought about summer classes or activities for my children until recently when I realized it’s almost summer. In the past years, summer flew by without my lil’ GJGs committing to any summer program. They were too young then and a few out of town trips to the beach were enough to satisfy their hunger for activity. This time lil’ Ms. GJG insisted she do something for summer. I was pretty surprised by this, given she’s the type who would be entertained & thrilled to answer worksheets & do other activities at home. I asked her what is it she’s particularly interested in and she gave me more that one option. Swimming, riding a bike, running, gymnastics, cooking, baking, and doing more arts and crafts. That’s what she answered. Uuuum hun, Summer is just about 8-10 weeks long, I don’t think we can do all of these at the same time. This was my reply. I like that lil’ Ms. GJG is excited for summer. I like that she’s eager to immerse herself to different activities that can satisfy her curiosity and ignite her senses & ability to test her self. Lucky for us mommas who have such eager beaver kids, there’s a new summer program in town- FitKids. FitKids is one of the first Fitness and Health Summer Camps for kids here in Manila. It is a camp for children ages 3 to 10 and will cover 9 sessions of a 3-hour activity-packed day. These activities will include Zumba, light boxing, HIIT (which stands for High Intensity Interval Training) strength building, basketball, cooking and art activities related to health and fitness. One of the main objectives of FitKids is to promote values like Character-building, Respect, Responsibility, Caring, Honesty, Fairness, and Good Citizenship. Through the FitKids activities, children will also learn a sense of teamwork and camaraderie as they work hand-in- hand with other children, their coaches and their teachers. Starting them young is always the way to go! Fitkids is powered by three powerful brands related to health and fitness- Elorde Gym, Fruit Magic, and HIIT Philippines. These teams will help your children develop personal activity and fitness behaviors which will allow them to understand why it is necessary to live healthily in their formative years. Their program will promote learning for a better balanced life involving active work that will contribute in your child’s physical, intellectual, and emotional being. As early as 3 years old, children already have the capacity to internalize things they hear, see, feel and taste. The age group wherein kids absorb everything they learn is from 0 to 7, therefore concluding that whatever they learn between these ages is crucial. If you’re looking for a great summer activity for your children then you’d want to consider FitKids Summer Camp. They have an Early Bird Rate of P7,500 (regular rate is P8,000/child) per child until February 15, 2015. For further inquiries or if you would like to enroll your kids, you may email Fitkids at [email protected] You may also contact them at 0917-8800519 or 0917-5138377. I’m thrilled that FitKids is starting this April 2015! I think this is the first summer camp that is not only focused on the health & fitness of children, but as well as their overall wellness. I like the idea that through Fitkids, children get to do fun and challenging actives that not only keep them productive and busy, but also help them learn substantial lessons in life that concerns their health. Remember that smart parenting will lead your children to a better place in the future. Invest on activities that lead to opportunities to make memories & moments. So excited for lil’ Ms. GJG to attend her first ever summer camp with FitKids!